This has to be one of the coolest products I saw at Interbike. 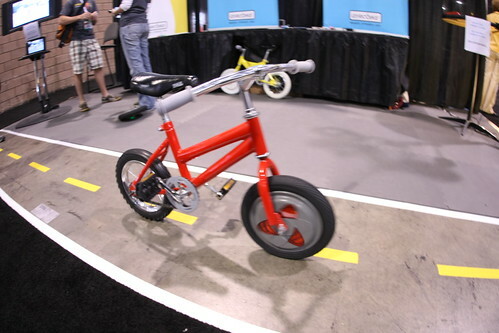 I agree…absolutely awesome concept…right after interbike last year they let me use a prototype wheel to teach my 4 year old to ride…I taught her to ride in 10 minutes…thats right…10 minutes! the Gyrobike wheel made teaching her to ride soooo easy! I so want that for my two kids. Wow, once this new product gathers some momentum it will turn up everywhere. The way to turn a bike is to lean it, not drive it like a bus. Training wheels teach a child nothing but how to pedal and get stuck on gaps in the pavement. The most effective way to teach a child to ride a bike is to remove the pedals and put the seat low enough so they can walk the bike around until they are able to coast with their feet in the air. Great – a heavy gyroscope added to an already heavy kid’s bike, and it doesn’t teach the kid how to ride. When it comes off, the kid has to re-learn. Web Design has nailed it in one. While this is interesting it won’t really teach a kid how to ride. Removing the pedals and lowering the seat it the way to go. You can actually get special learn to ride bikes that don’t have pedals and are like a seated scooter. They will give your child much better riding stills than this ever will. …says Chris, who’s probably never taught a kid to ride using one of these gyro bikes. Sounds like an ingenious idea to me. I bet that scaled up it also has a great future for making cycling more accessible to grown-ups with balance issues/fears. I wonder what the cost is. I bet it would be better as a bike-shop rental rather than an out-right purchase since it would be used for a relatively short duration compared to the cost. Having coached a kid using the “take the pedals off” method, I think that this could still be helpful in that last phase where they are using pedals to start riding. I wonder if the gyro could be made more simple by mounting it to the inside of the frame. Kids bike frames are quite small though. This is a great idea even if it doesn’t teach the kid how to ride a bike. I never learned to ride a bike for years because I could never balance a full size bike (I never had one of these small bikes as seen in the video) and the first time I thought I was riding the bike I flipped it in the middle of a road and that put me off wanting to try it again. Though it may not teach a child how to ride, when wanting to do family bike riding it could be a great thing. As an aging person who no longer can ride a bike due to medical issues adversely effecting my ability to maintain balance, this device would be helpful. If the developer could lower the weight and make the automatic balancing assist adjustable by the rider, it would be great. It seems like the first time I saw this concept (last year…perhaps even before Interbike 2008), it was shown being tested on an adult-sized bike. The idea was for balance-challenged adults to be able to ride with such a device in place. I think the add-on gyro simply magnifies this effect for lower-speed use such as a novice bicyclist, but then again I could be wrong. It’s a neat concept, in any case. Did you people even watch the video or listen to the video? It states that the gyro has different speed levels at which you can set it. You set it at high to help your child get used to pedaling and steering without the worry of falling. Once they get used to pedaling and steering the bike you gradually turn down the gyro so that they can learn to balance the bike themselves. I swear, it really pains me when people don’t pay attention, or even do some research before making uninformed comments. Yes the idea is precession. A regular bike already works because of precession, and this device seems to impart a lot more precession (by housing a heavy wheel spinning fast). Think of the outside of the wheel which has mass. This mass is trying to fling outward, in one plane. It has inertia, so it will tend to remain in that plane. So if the wheel tries to lean over, the mass is trying to remain in its original plane and will resist leaning, just like a heavy object that is hard to move. Kind of expensive for a training wheel replacement though? Is it on the market? And where can I order it? Where can I buy the cool wheel???? I’m from the Netherlands! I can see some value to this, as a replacement for training wheels. Getting the coordination for pedaling, braking, and steering is helpful, so there’s fewer elements to learn at one time. The “feel” of the bike may be more “accurate” than training wheels. My 6 year old son is having a very hard time learning to ride. We’ve removed the pedals and had him practice going down gentle hills. He is still terrified and refuses to practice. He wants his training wheels back on. I would definitely try this gizmo to get him over the hump. When I taught my kids to ride, the first thing I taught them was to stop. I don’t know how you do that on a kid’s bike without pedals. i would like to buy one for my daughter. Answer to Sungsu … um… hand brakes? You bike should have HAND brakes??!! Even the small size ones with “back” pedal brakes should have hand brakes also. Feet slip off all the time hands not so much (still being on the bike anyway). Sungsu, actually the way you teach a child on a pedal-less bike is to put both feet down like outriggers and do a “Fred Flintstone” stop. The outrigger method takes the place of training wheels and is a much faster way to learn balance anyhow. From what I remember, the MSRP was set to be $100. Wow! That’s a great product and it really isn’t too bad of a price, especially if you plan to buy used etc. That is a great price, because most parents will have to teach multiple children. Starting with a used device at around $50 – $60, this could be a great investment for families of two or three young children. I finally learned to ride a bike by riding it in a concreted V shaped irrigation ditch (no water at the time.) The V was narrow enough that I could put my feet out to correct balance if needed, the base of the V holding the tire steady at the same time. I walked my bike up to the ditch, ‘rode’ down it twice, and rode my bike home by myself thereafter. A small bike without pedals is probably the next best thing, so that feet can go down when needed to correct balance. This may work well, too. They should be available to rent for $10 – $20 for a weekend, and if they’re so great, then they won’t be needed after that. Pingback: Gyrobike’s Gyrowheel stabilizes a kid’s first bike without the training wheels | Gadgetorium! This is cool. I have always removed the pedals and let my kids learn by gliding down hill. This low tech method works well enough, but this gyro looks even better. As long as it is not too expensive. My question is this. Could this be of use on a unicycle? Learning to ride a bike is easy, but a unicycle is hard. I’ve love to learn but don’t have the youth to put up with falls. If this could be a big help with a unicycle, then I see this having even more value. I could see many people who ride a bike ride a unicycle instead. A unicycle is much lighter and smaller. It is just that they have a harder learning curve. Something like this maybe could help lower that learning curve. 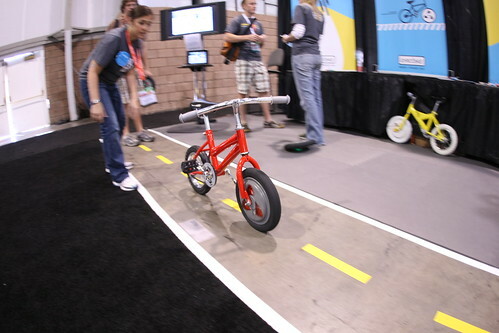 Pingback: Gyrobike’s Gyrowheel stabilizes a kid’s first bike without the training wheels | Leopard O.S. Pingback: Gyrobike’s Gyrowheel stabilizes a kid’s first bike without the training wheels « Tech Pulse! This is really good but are we going a little to far to make our children getting habitual to this much technology?? place a motor in it and why make them learn bike if they are going to drive amazing cars in future?? I’m an adult that never learned to ride; last time I tried I was a 13yr old that got laughed at my some pretty girls I desired. No attempt since. So, ah…where and when can I buy one of these for a 19″? As for adult-sized Gyrowheels, we are in the process of developing it. We are also working on partnering with a bike manufacturer to have a full Gyrobike for sale in stores, but again, we’ll let the wonderful folks on our email list know all the details. when will the gyro wheel be available in the uk, and why the delay? If you’re trying to teach a preschool age child to ride, I think a balance bike is a better approach then the gyro wheel. Balance bikes are lighter than standard bikes and really low to the ground. They don’t have pedals, so kids learn to balance first. That’s really the skill kids need to master. I can see how this gyro wheel could be used to gradually teach kids to balance and ride, but why bother with that? Once you remove the gyro wheel, your kid is going to be stuck with a heavy bike that’s hard to control. If you’re teaching a school age child, just remove the pedals from the bike and lower the seat. Let them get their balance down then put the pedals back on. It works. its really nice bike. its features great. new technology use in this bike so this bike attractive for most of the peoples. you can also exercise at home recumbent exercise bikes. By using this outdoor Interbike, children have a place to go relax, have fun, and get in better shape. It is not only children that can benefit from a bike. Even adults can use it too, and it is a great method for exercise and enjoyment – bouncing on an outdoor. This kind of bicycles are more loved by children. I just love this bike.